Since 1981, our professionals created more than 1,300 business plans for clients. Clients have raised over $2 billion in funding. Clients can grow quicker and have the funding they need to succeed. Successfully grow your business and with a plan you have a greater chance of success. We help clients get the right research, strategic guidance and tactical marketing plans to dominate their marketplace. our initial advice on your business ideas, financing options, and growth opportunities. Then we can discuss specific options for working together. Over 35 Years of Business Consulting Experience. For those looking to write their own business plan. Business plans are your way to show lenders that your new venture is well thought out, competitive and likely to succeed, in short — that it is worth financing, if needed. 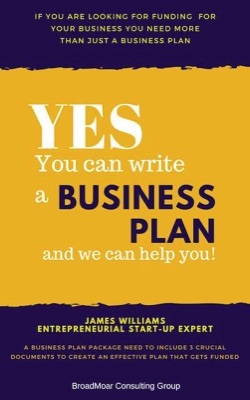 Your business plan is probably the most important document you ever prepare for your business. Before you even start your business, you should prepare a business plan. A good plan can be the difference between success and failure. The executive summary and the financial statements are probably the most important parts of a business plan. The executive summary should never be more than two pages. And the financial statements have to make sense. If you’re going to be looking for money from family, they may not want to see your business plan. Close family will probably trust you. The biggest problem about borrowing money from family members is that if the business does not succeed, you will constantly be reminded of any money that was lost. If you are expecting friends to invest in your business, they will probably want to read your business plan. They want to see that you have thought it through and that you have a fairly detailed plan for how you are going to use their money. They will also want to see that the proposed business will be able to pay back their investment and make them some money. Many bankers don’t actually read all of your business plans. They will probably read the executive summary and they will thoroughly read the financials. They want to know that their loans are secured with proper collateral and that the business has enough excess cash flow to repay the loan. We are experts at writing business plans and have prepared business plans for many different types and sizes of business. Our experts will teach you the important steps in developing your business plan, marketing plan, and financial worksheet. Many people who prepare business plans use a cheap software package that does all the work for them, so they can churn them out quickly. If you are only quoted a thousand dollars or two for a business plan, it is almost certain that you’ll get a document generated by one of those business plan software packages. After all, the writer has to make a decent living, so they have to get them written quickly. We do it right. We will challenge your assumptions and use our many years of business knowledge to make sure that your business plan makes business sense. We will help you define your market and how to sell to them. We will never say something like: “The market for the product is 50 million dollars. If we only achieve two percent of that market, our revenues will be one million dollars.” We will work with you to prepare a professional document — a business plan that works for you.